Earlier this week The Lord Mayor of Sydney, Clover Moore, joined Greenland Australia’s Managing Director, Sherwood Luo, in officially opening the striking Omnia building in Pott's Point. Those in attendance at the ribbon-cutting ceremony included construction partners Probuild, architects Durbach Block Jaggers, SJB and Studioaria, in addition to other project consultants. 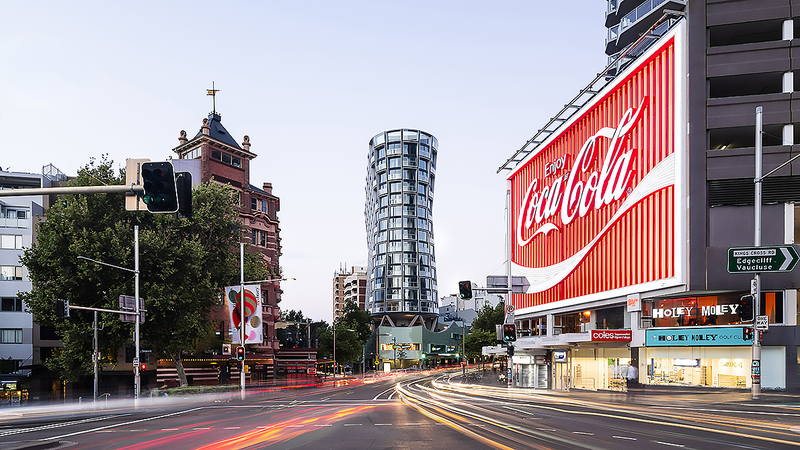 The $320 million, 20-storey Omnia apartment building features 132 residences, and is uniquely located between Victoria Street and Darlinghurst Road, with the development already gaining widespread attention for its dramatic curved form sitting atop a uniquely sculptural retail podium, which houses a Woolworths Metro. Omnia marks Greenland Australia’s fourth completed project since commencing in Australia in 2013. Two of Omnia’s three luxury dual-level penthouses, remain for sale and are priced between $12 million and $15 million. Probuild have been responsible for Omnia’s high-quality construction, Durbach Block Jaggers for its distinctive design, and SJB and Studioaria for its premium interiors. This exceptional build quality is important given Omnia’s high-profile location, which effectively redefines the gateway to Potts Point and Kings Cross, one of Sydney’s most iconic food and beverage and entertainment precincts. As such, we felt the site warranted a world-class building with significant architectural merit, and thanks to our amazing project partners, I think we’ve more than delivered. The building’s distinctive hourglass shape wasn’t simple to execute, but I think you’d all agree it was well worth the challenge. It’s truly unique. Omnia is a premium offering in every respect – its luxurious interior design concepts, superior construction and finishes, and its setting in one of Sydney’s best-selling locations and one of the world’s best. Omnia has been a fantastic project to be involved with. As an adaptive re-use project, we completed partial demolition of the previous building while designing and constructed around the existing structure that remained. The unique design introduces a dramatic architectural feature whereby each slab decreases by 180mm in length per floor over 10 levels and then increases again, resulting in the tower’s distinctive hour-glass shape. We have a very close relationship with Greenland Australia and we look forward to continuing it as we complete our next iconic Sydney address together at the Greenland Centre Sydney, which will be Sydney’s tallest residential tower when built.